I’ve always heard about how enlightening a trek through a traditional Sri Lankan village can be so when I heard that the good folk at Sir Johns Bungalow were planning to take us on one I was thrilled. A perfect cup of steaming coffee was the start we needed before we headed out. We had to travel in our vehicle to the village as it was about 25 minutes away. After quite a bumpy ride, we were at the starting point of our trek, all of us dressed in leech socks and warm clothing to cut off the expected chilly mountain breeze. 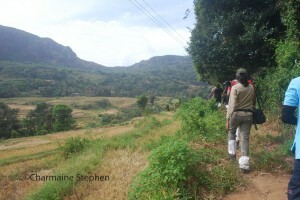 But we must have been treated to what we have come to know as ‘Red Dot luck’ because despite all the preparations, we didn’t encounter any pesky leeches or icy cold wind – It was truly the perfect day for a trek! 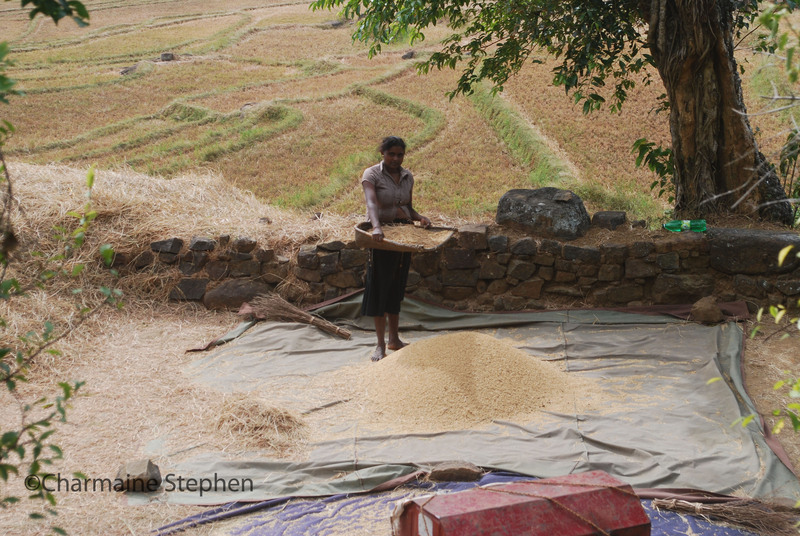 A few minutes into our walk, we came across a small patch of land where two ladies were laying out rice grains to dry, and despite them being busy, they always found the time for a smile. It was a truly eye opening experience to see some of the practices that the modernised cities and towns had long let go of. As we continued on our way, we could hear the soothing sound of a flute being played not far from us. In my head, I pictured an old man, sitting in a corner and playing the flute but as we got drew, we saw a young man sitting on a ledge, playing the flute, without a care in the world. My initial reaction was honest jealousy as for most of us who live away from the villages, daily life is so noisy and chaotic – this? …this was just bliss. Fighting thoughts of wanting to stay back, I continued along with the rest of our group. Soon we came to a small fence which we had to jump over. 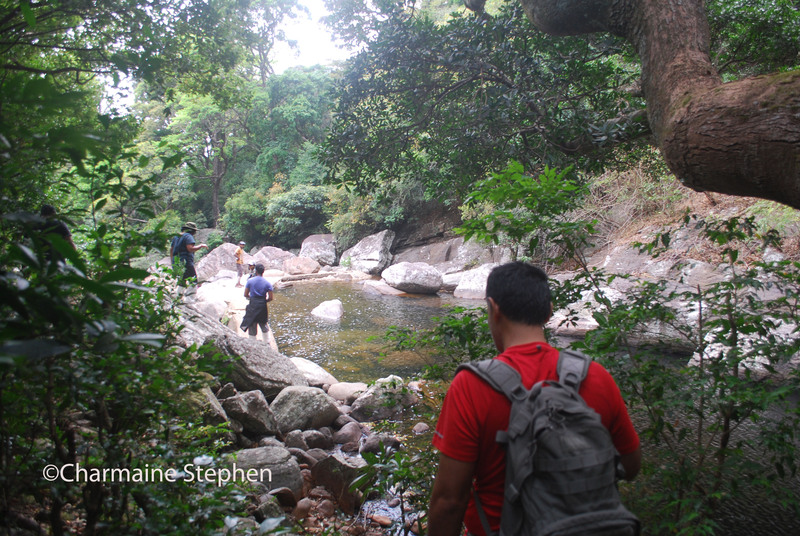 We then made our way through creeks and patches of dense forest. There was so much to take in- it was calm and quiet- a perfect way to relax a weary mind and appreciate the therapeutic powers of nature. Along the way we stumbled across a rarity, a beautiful Blue Oakleaf- a butterfly endemic to very few parts of Asia. We spent a while trying to snap up a decent picture of the gorgeous creature. Throughout our walk, the beautiful view of the Knuckles mountain range was never too far away. About 40 minutes into our trek, we reached a small river where all of us were tempted to take a splash, but unfortunately time constrained us. We did however get to dip our feet in the cooling waters for a couple of minutes- which was heavenly I must say! We then reluctantly resumed our trek – minus the leach socks this time, weaving our way through the jungle. 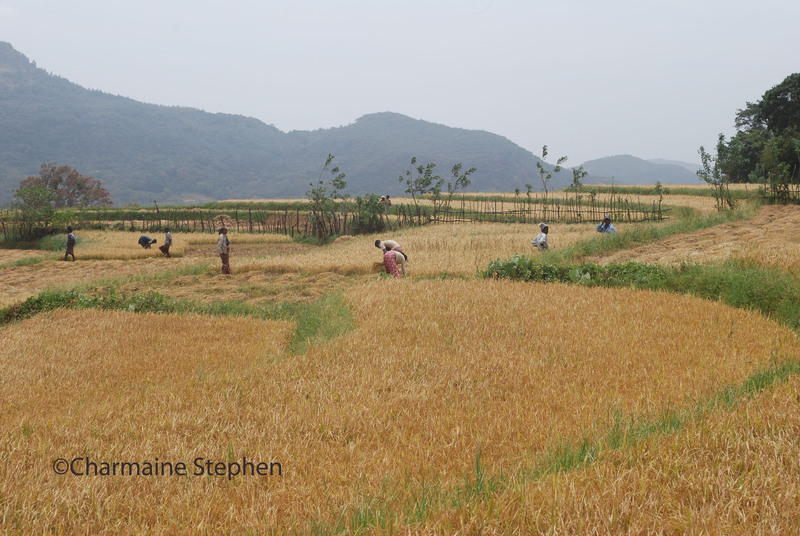 After a while we found ourselves in a wide open space, with neat patches of paddy fields- all looking so lovely. We saw many villagers working in fields, and some taking a well-deserved rest with a cup of tea. We walked through the paddy fields- something I had never tried before. Being somewhat vertically challenged, the rice plants were up to my waist and I could almost hide amongst the reeds! When we made our way out of the fields we knew we had come to the end of our trek- we were all exhausted but we were all also invigorated by the beauty of nature and the simplicity of village life that we had seen. Alas! The hustle and bustle of city life beckons – we have to head back!